Stefan Svard first found out he loved working with audio at the age of 13 within the confines of his church youth group. Years later, he graduated high school and his first instinct was to go to Ridgewater College for an audio degree. During his freshman year, in 1994, he took an internship with a company called Audio Video Electronics (AVE). Little did he know, AVE would soon be under his name. 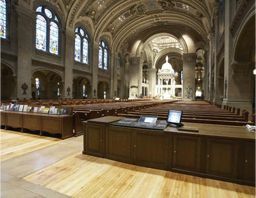 AVE integrated a new system into the Basilica of St. Mary Church in Minneapolis, MN. Seeing as how AVE has grown significantly since Svard took over in 1999, expanding to 16-18 full-time employees, it appears as though the company’s outreach and learning efforts have certainly been rewarded.